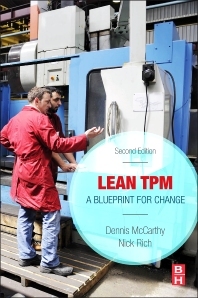 Lean TPM is an accessible, step-by-step guide designed to help you increase manufacturing efficiency through continuous improvement. Based on their experience of working with organizations that have successfully achieved outstanding performance, McCarthy and Rich provide the tools and techniques required to convert strategic vision into practical reality. Packed with real-life case studies and examples to highlight common pitfalls and proven approaches, the book focuses on the continuous improvement that can be achieved within any manufacturing environment by challenging wasteful working practices, releasing the potential of the workforce, and making processes work as planned. Lean TPM contains an integrated route map along with comprehensive benchmark data to enable engineers, technicians and managers to fully explore this potent technique. Engineering managers in the manufacturing sector, including quality, process, maintenance and production managers. Process improvement and maintenance engineering consultants. 2.5. What Does Lean TPM Offer? 4.3. What Do We Want from Senior Management? 8.2. Why Engage the Supply Chain?